"You will realize that I AM"
Moses accordingly made a bronze serpent and mounted it on a pole, and whenever anyone who had been bitten by a serpent looked at the bronze serpent, he lived. then you will realize that I AM"
The truth of Jesus' divinity is confirmed by his Resurrection. He had said: "When you have lifted up the Son of man, then you will know that I am he." The Resurrection of the crucified one shows that he was truly "I AM", the Son of God and God himself. So St. Paul could declare to the Jews: "What God promised to the fathers, this he has fulfilled to us their children by raising Jesus; as also it is written in the second psalm, 'You are my Son, today I have begotten you.'" Christ's Resurrection is closely linked to the Incarnation of God's Son, and is its fulfillment in accordance with God's eternal plan. "O eternal God, you know what is hidden"
Fifth Sunday of Lent: "We want to see Jesus"
"All, from least to greatest, shall know me, says the LORD." The Church is the "gathering" and the true "family" of God. At the center of the life of the Church is the Lord, "raised up" in the Eucharist, that all the world, "from least to greatest", may see and know Him. Is it not we, the members of His Body which is the Church, who lift Him up that He may draw all the world to Himself; lift Him up every day in the Holy Sacrifice of His Cross and Resurrection in the holy Mass? All are able now to see the Lord, " from least to greatest" and all are now drawn to Him as the Church lifts Him up in the sacred Scriptures proclaimed and proclaims Him, "lifted up from the earth" in the holy Eucharist, the risen Lord truly present Body, Blood, Soul and Divinity. Fifth Sunday of Lent: "I will make a new covenant"
Sacred Scripture for holy Mass of the Fifth Sunday of Lent. "Let us destroy...let us cut him off..."
for to you I have entrusted my cause!" "...a division occurred in the crowd because of him." Sacred Scriptures for holy Mass of Friday in the fourth week of Lent. "Let us beset the just one"
"he is obnoxious to us." "the one who sent me, whom you do not know, is true"
Sacred Scriptures for the celebration of holy Mass on Friday of the fourth week of Lent. "the Father has sent me"
"Go down at once to your people"
"the Father who sent me has testified on my behalf." Sacred Scriptures for holy Mass of Thursday in the fourth week of Lent. "Behold, I come to do your will...By this 'will,' we have been consecrated." Sacred Scriptures for holy Mass in celebration of the Solemnity of the Annunciation of the Lord. Immediately the man became well, took up his mat, and walked." Sacred Scriptures for holy Mass of Tuesday of the fourth week of Lent. "...and he and his whole household came to believe." Rejoice in believing. Believe in rejoicing. Be recreated in Christ the Lord. In Him are all things made new. Sacred Scriptures for holy Mass of Monday in the Fourth Week of Lent. And so we see that the living Lord, who founded this Church by the sending of the Spirit and who made, and continues to make of us, His own people by that same Spirit, sends “messengers” to us that we might hear and know the truth and also might be granted the grace of living in this way of salvation, the Church, which is the "place of Faith". 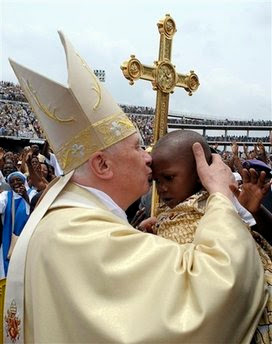 Also in these days our Holy Father fulfills this mission as messenger through his trip to Africa. His role of service is to preach the truth which they, as well as we, have a right to hear. Howls of condemnation and protests in Europe greeted his words of moral teaching. What strikes one about these events in our days is not that people have disagreements. People disagreed with Christ in his own day and you can all witness the result in Christ raised up on the Cross, "drawing all men to Himself". No, the disagreements are not a cause for surprise. 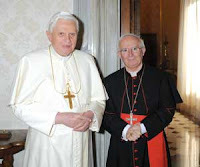 What is unique is that the forces of the dictatorship of relativism react with scorn, derision and sometimes violent opposition when someone like our Holy Father Benedict refuses to bow to their rigid, pagan and diabolic creeds. They demand that he be mute and succumb to their pressure. His courage in Christ and the Holy Spirit call him to do otherwise. It simply is his job to the speak the truth, whether popular or not, and never under any circumstances can he approve of any moral evil, whether contraception or abortion or corruption in government or sexual violence against women. "Indeed, as a corrective to a widespread relativism which acknowledges nothing as definitive and, even more, tends to make its ultimate measure the individual and his personal caprice, we hold out another measure: the Son of God, who is also true man. Christ is the measure of true humanism. The Christian marked by an adult and mature faith is not one who is borne along by the waves of fashion and the latest novelties, but one who lives deeply rooted in the friendship of Christ. This friendship opens us up to all that is good, and it provides us with the criterion for discerning between error and truth." "One such human reality, presently faced with numerous difficulties and threats, is the family. 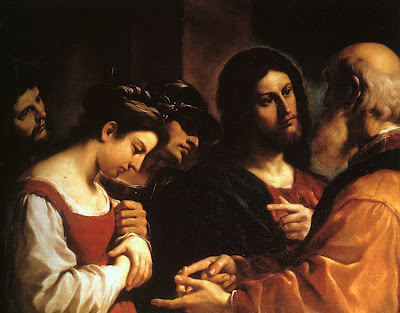 Families are particularly in need of evangelization and practical support, since, in addition to the fragility and lack of inner stability of so many conjugal unions, there is the widespread tendency in society and culture to call into question the unique nature and specific mission of the family based on marriage. 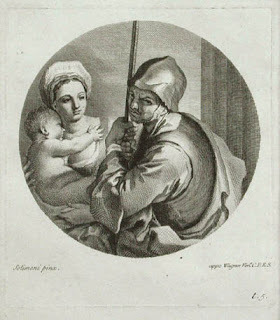 In your pastoral concern, which extends to every human being, continue to raise your voice in defence of the sacredness of human life and the value of the institution of marriage, as well as in promotion of the family’s proper role in the Church and in society, at the same time demanding economic and legislative measures to support the family in bearing and raising children." ...so that everyone who believes in him may have eternal life. Sacred Scripture for holy Mass of the Fourth Sunday in Lent. "...he has struck us, but he will bind our wounds. to live in his presence." "...the one who humbles himself will be exalted." 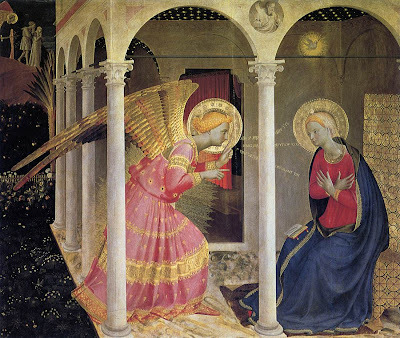 This final stage stays closely linked to the first, that is, to his descent from heaven in the Incarnation. Only the one who "came from the Father" can return to the Father: Christ Jesus. 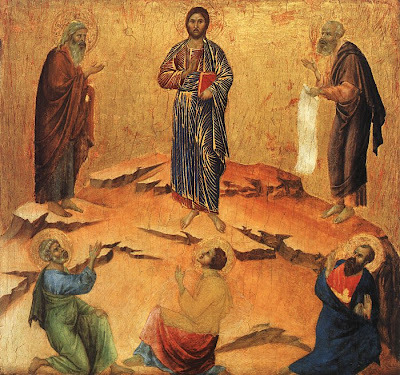 "No one has ascended into heaven but he who descended from heaven, the Son of man." Left to its own natural powers humanity does not have access to the "Father's house", to God's life and happiness. Only Christ can open to man such access that we, his members, might have confidence that we too shall go where he, our Head and our Source, has preceded us. Sacred Scriptures for holy Mass of Saturday, the Third Week of Lent. "...you have collapsed through your guilt. and return to the LORD." Jesus summed up man's duties toward God in this saying: "You shall love the Lord your God with all your heart, and with all your soul, and with all your mind." This immediately echoes the solemn call: "Hear, O Israel: the LORD our God is one LORD." I thought that continence arose from one's own powers, which I did not recognize in myself. I was foolish enough not to know . . . that no one can be continent unless you grant it. For you would surely have granted it if my inner groaning had reached your ears and I with firm faith had cast my cares on you. Click here for the sacred Scriptures for holy Mass of Friday of the Third Week of Lent. It is he who shall build a house for my name.' "
"I must be in my Father's house." Click here for the sacred Scriptures for the Solemnity of Saint Joseph. 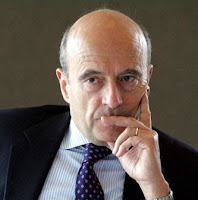 Alain Juppé: "Will no one rid me of this meddlesome priest?" 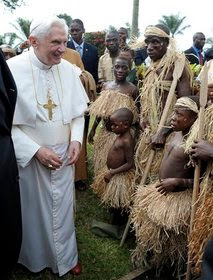 This because Benedict XVI teaches the truth of the law of God to the African people whose human dignity and God demand that he do such. There was another man who once incited murderers to commit the act of making a martyr of the Church in England by saying something very similar. Is this hate speech? Can this be considered a crime, also? Or is there room for hating one person, one group, one religion because he and they will not bend to the pagan and diabolic creeds of this age? 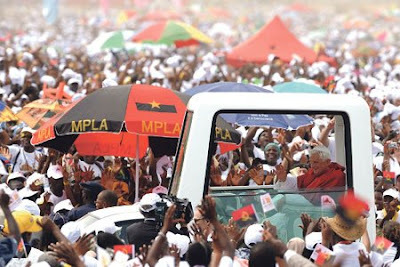 “ ‘It is my belief that the most effective presence on the front in the battle against HIV/ AIDS is in fact the Catholic Church and her institutions. . . . The problem of HIV/ AIDS cannot be overcome with mere slogans. If the soul is lacking, if Africans do not help one another, the scourge cannot be resolved by distributing condoms; quite the contrary, we risk worsening the problem. "whoever obeys and teaches these commandments will be called greatest "
Click here for the sacred Scriptures for holy Mass of Wednesday of the third week of Lent. "Forgive your brother from your heart." In the prayer taught by Our Lord we pray: "Forgive us our trespasses as we forgive those who trespass against us." Click here for the Scriptures for today's holy Mass. 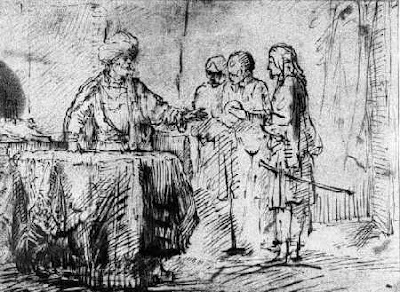 "Amen, I say to you, no prophet is accepted in his own native place." 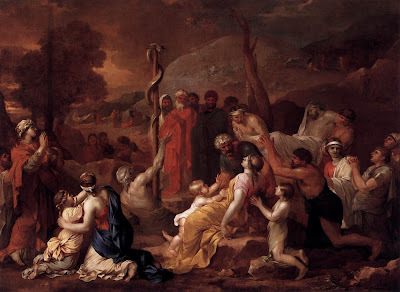 Naaman the Syrian worships the God of Israel on the evidence of the works of His prophet. "...there is no God in all the earth, except in Israel." (2 Kgs 5:1-15ab) The Lord's own people, who witnessed His miracles and many other good works, not only refuse Him -- they would go so far as to kill him: "they were all filled with fury. They rose up, drove him out of the town, and led him to the brow of the hill on which their town had been built, to hurl him down headlong." "Precisely for this reason I thank all the more our Jewish friends, who quickly helped to clear up the misunderstanding and to restore the atmosphere of friendship and trust which – as in the days of Pope John Paul II – has also existed throughout my pontificate and, thank God, continues to exist." Let us pray that such behavior, shameful and unworthy of Christians, never again scandalize others against the Christ, the One in whom all prophecy is fulfilled, our Divine Founder and Lord. The Third Sunday of Lent: "Zeal for your house consumes me." Click here for the Sacred Scriptures for the Third Sunday of Lent. 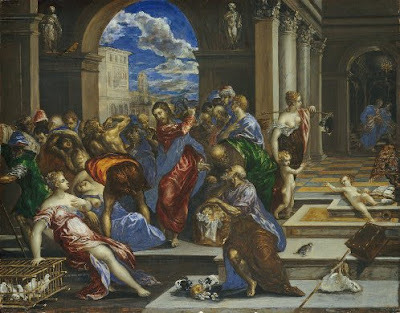 Christ cleanses the temple which is each human person, making of it "a dwelling place for God in the Spirit", through the forgiveness of His Mercy. And what is the "sign can He show us for doing this?" The temple of His Body was destroyed by death and in three days He rose. The zeal of the Lord Jesus is for His Father's house in every human person, become a dwelling for glorifying the Father through the splendor of the Holy Spirit. Meeting Christ in the Liturgy offers a reflection for the Third Sunday of Lent . "he longed to eat his fill of the pods on which the swine fed"
"Long" no more for worldly comfort, the empty show, the superficial food that can sustain only for a time. Feed not upon the "pods," the food of mere beasts which provides a comfort that can be taken away. No, long rather for that only which can sustain true sons and daughters of the Father: Jesus Christ is the true "fatted calf" the only feast worthy of sons and daughters, truly the "food" of the royal wedding feast of the Lamb which will last forever. Yes, "let them feed...show us wonderful signs." The most wonderful Sign, and that upon which the whole world ought to feed, is the True Bread which is Christ: "Behold the Lamb of God, behold Him who takes away the sins of the world. 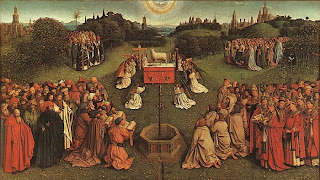 Blessed are those who are called to the Supper of the Lamb." Letter of His Holiness Benedict XVI: "overriding priority is to make God present in this world"
Vatican II "carries with it the entire doctrinal history of the Church"
In his letter to all Bishops of the world on the removal of the excommunication of the Bishops of the Priestly Fraternity of Saint Pius X (FSSPX / SSPX) and on all aspects involving the subsequent problems related to Bishop Richard Williamson, to be published officially tomorrow, Pope Benedict XVI rebukes those who would welcome with open arms brothers and sisters outside of the household of the Faith while preserving for ridicule and marginalization those who share some aspects of our Faith yet stand in need of full reconciliation with the Church. 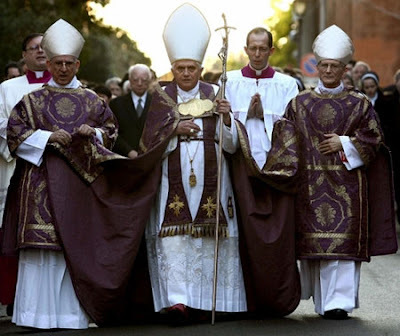 The letter will announce that the Pontifical Commission "Ecclesia Dei" will be placed under the authority of the Congregation for the Doctrine of the Faith (though, as of this moment, it is not clear if only regarding doctrinal matters). The Pope makes clear for Traditionalists that it is not possible to "freeze" the Magisterial authority of the Church in 1962 - but he also chides those who proclaim themselves to be "great defenders of the Council" but who do not wish to understand that Vatican II carries with it "the entire doctrinal history of the Church"
-- The full text of the letter to the bishops is now available at NLM. Vatican II liturgy in practice: "a change in the forms but no true renewal"
30 Giorni: What memories do you have of this phase of liturgical reform? Card. Cañizares: I believe that a deepening and a renewal of the liturgy were necessary. But according to how I have experienced it, it was not a perfectly successful operation. The first part of the constitution Sacrosanctum Concilium [NLM note: dealing with the general principles and the promotion of the liturgy] has not entered the hearts of the Christian people. There has been a change in the forms, a reform, but no true renewal as requested by Sacrosanctum Concilium. Sometimes there has been change for the simple desire of change with respect to a past perceived as all negative and superseded. Sometimes the reform has been conceived as a rupture and not as an organic development of Tradition. Hence all the problems aroused by the traditionalists attached to the rite of 1962. 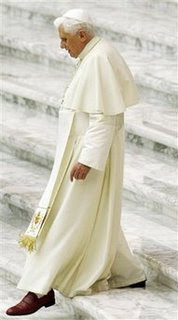 30 Giorni: We are talking about a reform, then, which, in fact, has not fully complied with the conciliar mandate? Card. Cañizares: Most of all I would say that it was a reform which has been applied and above all which has been lived as an absolute change, as if there had to be created an abyss between the preconciliar and the postconciliar, in a context in which "preconciliar" was used as an insult. -- Interview in Italian monthly 30 Giorni with Antonio Cañizares Llovera, the Prefect of the Congregation for Divine Worship and the Discipline of the Sacraments, on the implementation of the Vatican II reforms of the sacred liturgy. "We have rebelled and departed from your commandments"
"O LORD, we are shamefaced, like our kings, our princes, and our fathers, for having sinned against you." Today the ideocrats of the cult of death, "the kings and princes", claim the mantle of science as they approve funding for embryonic stem cell research. They claim that to oppose this measure is "ideology". It is a matter of reason, not ideology, to defend the life of the human person, whether an embryo or a former embryo. 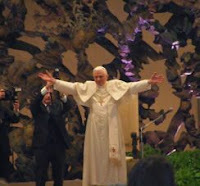 Christ speaks through our Holy Father Benedict who tells us "Defend Life!" The humanity of the embryo is a matter of scientific fact. That the destruction of the human embryo is the taking of a human life is also a scientific fact; to do is so to "depart from" God's commandments and to do evil for God has commanded, "Thou shalt not kill." It is ideological to claim otherwise. The pro-life movement is firmly and irrevocably based upon scientific principles. The cult of death is a godless rebellion against the Creator Himself, the very source of science and reason. Read Bishop Finn's statement about President Obama's executive order on embryonic stem cell research. Scriptures for Monday of the second week of Lent. "Glorify God in Your Bodies"
Jesus Christ is the way for every man and woman. Security comes not from physical defense, for power ever escalates and the forces of nature are unpredictable. Weapons of destruction fall into evil hands every day and all of us live with the threat of violence. Peace cannot come through higher walls, more locks on the door or a move to the "country". The wise man will seek the security that can never be taken away: the fortification, the stronghold of God's grace, realizing that the only true threat is the evil that he embraces with his intellect and will, not that which he suffers at the hands of another. The strength of a holy life is possessing and living Christ's own life, the Resurrection and the Life which is victorious over every power. Jesus Christ is the only power which can promise us that, though we may sustain every torture or means of violence that man has sinfully devised for the destruction of the body, our heart, mind, soul and strength can yet be with God at every moment. No matter what may come in this life, no matter what the future may hold, we know and believe that a holy life is the only certain security, for in it lies the seed of heavenly glory. Anything which destroys the glory of God in us is rejected as evil by those who sincerely seek holiness. The worst violence is the destruction of God's image through man's own complicity, at an epidemic level today. The culture of death is at once the most ignored and the greatest threat. The moral evil of surgical sterilization in voluntary vasectomy, hysterectomy, and tubal ligation is a violation of the human person, yet a growing means of regulating births. Abortion is not only the murder of a child, it is at the same time dehumanizing and degrading for the mother. Sin is most evil for it renders man and woman incapable of glorifying God in their bodies. We glorify God in our bodies through a self-offering configured to the Cross and consecrated in the glorified and risen Christ. He reveals his glory to strengthen us for our share in His suffering which comes with total rejection of evil. Meeting Christ in the Liturgy offers a reflection for the Second Sunday in Lent. "Theological continuity is only correct reading of Vatican II"
The Motu Proprio "Summorum Pontificum" is presented as the most important activity in the papacy of Benedict XVI. What is your opinion? I do not know whether it is the most important but it certainly is an important document. 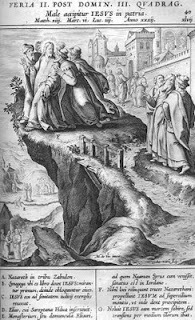 It is not only so because it is a very significant step towards a reconciliation within the Church, not only because it expresses the desire to arrive at a mutual enrichment between the two forms of the Roman Rite, the ordinary and extraordinary, but also because it is the precise indication, in law and liturgy, of that theological continuity which the Holy Father has presented as the only correct hermeneutic for reading and understanding of the life of the Church and, especially, of Vatican II. achieving the end for which I sent it." Christ is that Word which goes forth from the Father, in the words of the Sacred Scripture proclaimed and in the Holy Eucharist, that in us may be perfectly accomplished His purpose of salvation. Click here to read "On fully conscious and active participation"
Photo: Early morning snowfall blankets Saint Peter's Church. "Every believer...has the right to choose the way in which they will receive Communion." Travel the Lenten journey along with the Holy Father and the faithful of Rome with the tutorial on the Roman stational churches of Lent courtesy of the Canons Regular of Saint John Cantius. The angels serve Jesus, who is certainly above them, and His dignity is proclaimed here in the Gospel in a clear, though discreet, way. In fact, even in a situation of extreme poverty and humility, when He is tempted by Satan, He remains the Son of God, the Messiah, the Lord. Dear brothers and sisters, we would remove a notable portion of the Gospel if we forgot these beings sent by God, who announce His presence among us and are a sign of Him. Let us call upon them often, so that they may support us in the effort to follow Jesus to the point of being identified with him. Let us ask them, in particular today, to watch over me and my coworkers in the Roman Curia, who this afternoon, like every year, begin the week of spiritual exercises. Mary, Queen of the Angels, pray for us!